Mor Rubinstein was part of our 2013 MSc group, arriving from a Politics and Jewish History degree at the Hebrew University of Jerusalem. After the 2011 wave of social economical demonstrations in Israel she saw how the Internet can be used for different civic actions, an interest that got her working in an open data organisation in Israel, then brought her to the OII, and now to her current role as community and research coordinator for the Global Open Data Index at Open Knowledge, an international NGO that promotes use and release of Open Data. Interview with Karen Mead. 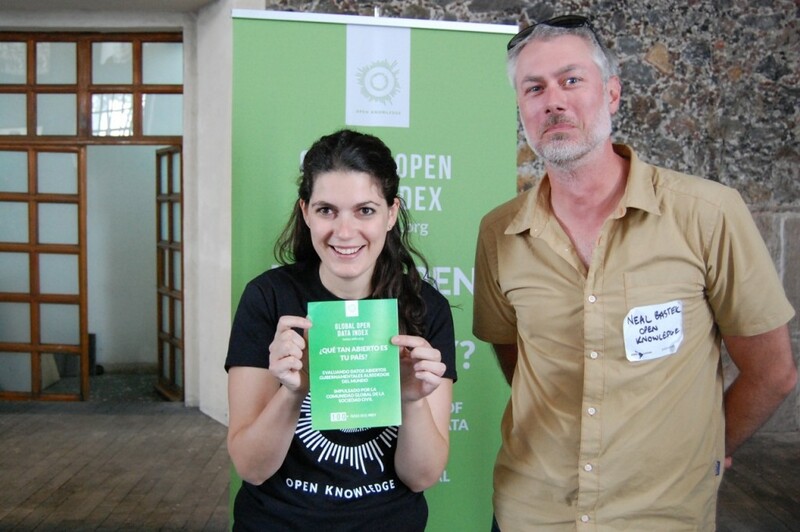 Mor Rubinstein and Neal Bastek promoting the Global Open Data Index at AbreLatAm in 2014. Karen: What first attracted you to the OII? Mor: I am the community and research coordinator for the Global Open Data Index at Open Knowledge, an international NGO that promotes use and release of Open Data. The Index was part of my thesis, and I’m glad to now be working to make it even better. The Index is the result of civil society collaboration to track the state of open data in countries and places around the world, and is used by some governments to set their open data priorities, and by civil society actors as an advocacy mechanism to encourage governments to improve their performance in releasing key datasets. Members of the public, civil society organisations and open data experts assess the availability and accessibility of the defined datasets in places around the world. Their submissions are then peer-reviewed and checked by an expert team of local and dataset reviewers. The Index ranks countries based on the availability and accessibility of data in thirteen key categories, including government spending, election results, procurement, and pollution levels. Our 2015 Index found that countries outside of Europe, the US & Canada have made some impressive gains in releasing key data. However, progress remains slow for most governments, who are still not providing key information in an accessible formats to be used, without restriction, by their citizens, civil societies, journalists and businesses. There’s still lots of room for improvement! Karen: Did your time at the OII prepare you for this? Mor: It certainly has! Specifically the research methods part — I’m using the skills I gained for the methodology of the Global Open Data Index. As the research lead, I have to make sure we undertake valid and reliable research, and the OII methods courses helped and prepped me for this task: I wanted to have more quantitative skills, so the statistics course was helpful for that. Mor: Be yourself, don’t be a template. Employers in the Internet field like to employ a variety of people. Also, be analytic and critical, don’t just answer what you think your employer wants to hear. Karen: Finally, what do you miss most about Oxford?